A simple flyer urging 1985 Hill Valley residents to save the clock tower, stuffed in Marty’s pocket, alerted 1955 Doc Brown to an easy source for 1.21 gigawatts of power, thereby helping Marty return to the future. And of course, there’s the obvious symbolism of a sleepy town trapped in 1950s nostalgia. Amongst most standard moviegoers, there isn’t a more celebrated movie clock. Great Scott! Any short list of the most iconic images of the silent film era would be incomplete without Harold Lloyd’s body, frantically clutching the hand of a clock atop a skyscraper. Speaking of the clock in Safety Last, Martin Scorsese mimicked the image in Hugo, his loving homage to early film. 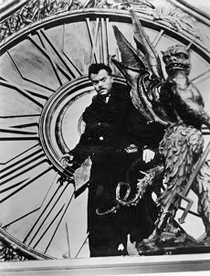 And while the image of Hugo hanging from a clock hand above the streets of Paris is an iconic one, Scorsese didn’t stop there with the clock imagery. The entire film revolves around clock-like mechanical gears, both literally and figuratively, with Hugo constantly seeking mechanical parts to put together his incomplete mechanical man. Scorsese even emphasizes it in the film’s opening shots (made more poignant in 3D), with an overhead shot of the moving parts of Paris, all moving in clockwork time. There is an incredible choreography that goes on in the denouement of High Noon, with the editing, the score, the foley artistry, and the expressions on the faces of the cast all working in lockstep with the swinging of a clock’s pendulum. It’s one of the best movie scenes you’ll ever find and establishes perfect pacing leading to the showdown at the end. 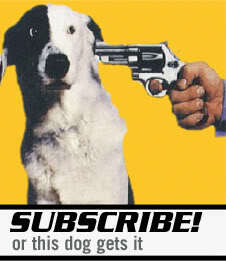 You can find the clip here and I’d urge you to check it out. The giant clock atop the skyscraper housing Hudsucker Industries even plays a key role in the film, showing the stoppage of time caused by Moses, the janitor. This allows the ghost of Waring Hudsucker to appear before Norville and alter the film’s ending. The clock in The Stranger works on multiple levels. Charles Rankin (alias Franz Kindler, a Nazi war criminal hiding in plain sight, played by Orson Welles) is trying to conceal his true identity from Nazi hunter, Mr. Wilson (Edward G. Robinson). The only thing authorities know about Rankin/Kindler is his obsession with clocks. Naturally, the film’s finale takes place in an elaborate clock tower. Rankin’s obsession with clocks alerts us that his time, like Isak Borg’s in Wild Strawberries, may be running out. It also tips us off that his meticulous care for clocks is indicative of his controlling nature. Great list. Glad to see The Stranger on this list. You should also check out the Ray Milland noir The Big Clock. It’s a nice little gem of a picture. I think I’d also include all the clocks from the opening scene of Back to the Future. Just because, Back to the Future. Great, now I have Huey Lewis stuck in my head. Welles’ face in “The Stranger” is priceless. Real good movie. It wouldn’t be a list like this without Back to the Future, but, c’mon…you left out both Hermione Granger’s Time-Turner *and* Cogsworth from Beauty and the Beast? Hello, McFly?! No, just joking…good stuff as always. Ha… both fantastic additions. Great choices! When I was in high school, I had a clock based on the shot from Safety Last which included a Harold Lloyd figure hanging from the minute hand. I wish I still had it! Great topic – I was going to suggest The Big Clock, but Dave beat me to it. That would be a really cool clock to own. I used to be a tour guide at Universal Studios when they were filming “Back to the Future”. After the movie came out, I pointed out the clock in “Courthouse Square” to tour guests three times a day, every day. Did you say “Save the clocktower”? I don’t think the ‘Metropolis’ clock was meant to tell time. Look at the way he constantly moves the hands around the face. Plus the third arm moves too fast to be an hour hand. My impression was always that it was some manner of machine. Brilliant list. I nominate the clock scene in Wild Strawberries for Best Dream Sequence of All Time. There are some clocks (The Stranger) that I didn’t remembered at first! Nice list though! I love Wild Strawberries and it makes me want to watch it right now! I’m very ashamed to say that I still haven’t seen Safety Last… I’ll check it soon as for Hugo. I found myself feeling the same way about Wild Strawberries when I put that clip up there. Once upon a time in the West, Jackie Chan’s Project A.
Please…would someone tell me the Name of that magnificent-looking MantleClock on (Jimmy Stewart’s apartment Mantel) in Hitchkock’s REAR WINDOW? I’ve GOT to find one.